The low training overhead of Process Simulator is an essential foundation for the successful use of process simulation in your organization, and its seamless integration with Microsoft Office eliminates the need for labor intensive training and intuitive operation of Process Simulator. Convince yourself. Use Process Simulator for your entry into the world of process simulation. Our tutorials and training videos will help you get started with Process Simulator. Starting with the groundbreaking modeling approach, Process Simulator offers powerful capabilities for successfully completing simulation studies. The real-world derived AREA meta-model also allows the beginner to create meaningful simulation models. A sophisticated development environment supports the simulation expert in the processing of complex tasks. The scenario manager simplifies the definition of various simulation scenarios. The powerful simulation engine guarantees short running times even of complex simulation models over long simulation periods. 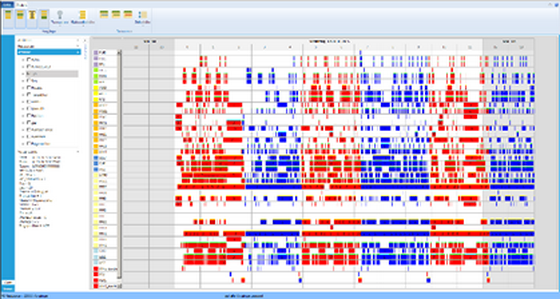 The Output Viewer is the central tool for analyzing your simulation results. Meaningful evaluations help you to identify the bottlenecks and potential for improvement in your processes. The interfaces to Microsoft Excel and Minitab completes the picture. Process Simulator can be used inter-industry for time-dynamic analysis of your task, the only requirements are that you can visualize your processes with a flowchart and process times are known. Learn about the many possible applications of Process Simulator. It does not matter whether they are production and logistics processes, a Lean Six Sigma, a health care or business processes. As described above, a large part of all processes can be modeled graphically by drag'n'drop and by simple parameterization. For more complex tasks, a modern powerful development environment is also available in the Process Simulator. Based on the process description, moving objects such as workpieces, means of transport, orders, patients are animated directly in the Visio drawing sheet during the simulation. Observe your computer model processes and identify the vulnerabilities. Use animatiosn as a communication tool. Process Simulator becomes a central part of your opportunity management. You can position your own key figures directly in the Visio worksheet. During the simulation, the current values of the key figures are displayed. Many users create such a simulation cockpit with the most important key performance indicators (KPIs) for situational evaluation of the simulation process. Depending on the problem, you can analyze your processes in slow motion or fast motion. With the help of webinars, tutorials and how-to videos you can get an easy introduction into the application and operation of the Process Simulator. Also, you can quickly get help and support on specific modeling issues. With the help of a web conference, we can present you the operation and functionality of our software products on your screen live during a telephone call. You can discuss your application scenario together with us and directly see the functionality of Process Simulator using the example of already implemented projects.